I ordered these wheels from Pure OffRoad after looking at several different places on the internet. The price was the best for what was included and the shipping was really fast and also free. 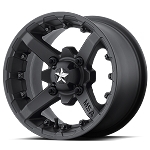 They look good on my ATV which I am in the process of having a lot of modifications done. will be glad when It's ready for the trail. 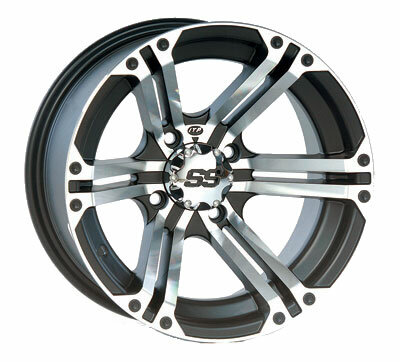 I had ordered the STI HD 3 Machined wheels and on the day after I ordered them I got a call from customer service advising me that they were on back order,so with that news I changed the order to these IPP SS212 machined, I had already been looking at these wheels so it was an easy decision, I paired these with the Interco swamp lite tires, when they arrived (3 days after original order, WOW that was fast), I absolutely loved them, the picture on the web site does not do them justice, have covered them in mud twice now and boy do they clean up with ease,the wheels are great and so is Pure Off Road,definitely will be using them again. The product is great, just like advertised. the customer service was outstanding. they went well above and behold any other place I've ever dealt with and the shipping was fast also. I will be a repeat customer. These are great looking whels with an excellent finish at a great value. they look great on my yellow kingquad. Great quality and realy durable when riding in mud and through terrain with trees they are very hard to scratch and scuff. Also easy to clean and look great. inside of wheel does not pack full of mud like you would think. great product as far as im concerned. I was looking for the perfect wheels to dress up my Arctic TRV. Found the SS212 Machined and noticed they had a link to view them on You Tube. Because of that I could get a better view of them. So, I ordered them. They were here within 3 days. Great service! I purchased these wheels and paired them with GBC Grim Reaper tires. I absolutely love the combo and they look AWESOME on my Grizzly. Pureoffroad is a great company and I will definitely use them again. They answer the phone and respond to questions and emails promptly. Check out their product reviews on YouTube if you're unsure what you want. Outstanding rims. Super quick service. Great product and pricing. Speeding shipping. I'm very happy with my purchase. Looks awesome on my Artic Cat Atv. I ordered the wheel and they arrived within two days...i had them on my 2008 honda rincon by the weekend. Service was great from Pure Offroad and i could not be happier. Thanks for the great service and look forward to additional purchases in the near future. A: Yes they will work with those tire sizes. Q: artic cat 500, 2006 automatic. 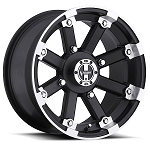 buying rear tires 27"-12.00-12 mudbugs, front 27"-8.00-12, can these wheels work? and not sure of bolt pattern 4/115. or can you suggest wheels to fit these widths? A: Yes these 12x7 wheels will work with both sizes of tires you are looking at. Yes the bolt pattern is 4/115. 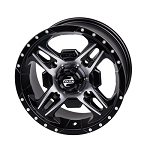 Q: I have a 2016 polaris ranger 900xp and the rear tires are 27x11-12 the front tires are 27x9-12 with these rims work with both tires? Also is the bolt pattern 4/156? Q: Dear Sir, What are the offset +5 or+2 mean? A: The first number is the amount of rim behind your hub, the 2nd number is the amount of rim in front of your hub. So this rim that is 7 inches wide would have 5 in and 2 out. For more info go to the help section on our website and you'll see a video about offsets. A: What bolt pattern do you have? Q: what are the width of the rims?